At RTH, we spend a fair amount of time looking at case studies from other cities as examples of things we could be doing in Hamilton, so it was a real treat, this morning, to see Hamilton used as a case study of what other cities could be doing. An article in The Atlantic Cities contrasts Hamilton's recent foray into tactical urbanism with the city of Vallejo, California, whose police department jailed a resident for painting a crosswalk on a dangerous intersection. While the Vallejo man was celebrated in his community but vilified by the authorities, a similar act of guerrilla road work in Hamilton inspired the City to make the crosswalk official (albeit after an initial bad reaction. The Atlantic Cities article quotes from RTH and includes photos by Maureen Wilson and Jason Leach and a clever poster by Matt Jelly. It also interviews Graham McNally of the Hamilton Burlington Society of Architects (HBSA), the group that sponsored the tactical urbanism workshop and talk, on the City's commitment to continue taking cues from the community on how to make safer streets. Glad to see Hamilton finally used as a case study! PROGRESS! Yes, it is great to see Hamilton finally used as a case study. And it’s not the only one. The U. S. Environmental Protection Agency and the U. S. Federal Highway Administration recognized Hamilton’s leadership in Asset Management in an 88-page report from 2009 entitled Multi-Sector Asset Management Case Studies. This study devoted 13 pages to what Hamilton is doing in this area. This report can be found with some searching on the EPA website. Spook shop or not, The Atlantic’s soothing IV drip of frictionless, borderless, culturally agnostic thought-output plays a useful scrambling role in the context of unmitigated national crisis. A featured Atlantic contributor can be counted on—without interference from any known machinery of coercion—to wax incredulous when the current GE CEO Jeffrey Immelt, for example, pleads with the audience at a competing Thought Leader conference to spearhead a manufacturing revival. What mystified Grove was the assertion, voiced by the economist Alan Blinder and others, “that as long as ‘knowledge work’ stays in the U.S., it doesn’t matter what happens to factory jobs.” This was not only inhumane, Grove declared; it was idiotic. But it is why the ideas, so-called, that inspire the omniscient gentlemen of The Atlantic are flat: their world is, literally, flat. Habitual “bipartisanship” has given way to a tendency to level the playing field between reality and fiction. And so in The Atlantic’s account of America’s present crisis, Hanna Rosin wonders whether it was not deregulation or securitization that caused the financial crisis, but . . . Christianity; and James Fallows suspects America’s awareness of its own decline is merely “our era’s version of the ‘missile gap.’” It’s as though, in purging labor from the ranks of accredited Thought Leaders, they have eradicated thought itself. One man's omniscient is another's crowd-sourced. Would be nice to see some of these transplanted here. Tactical urbanism appears to work best if it is supported or even carried out by the local authorities. 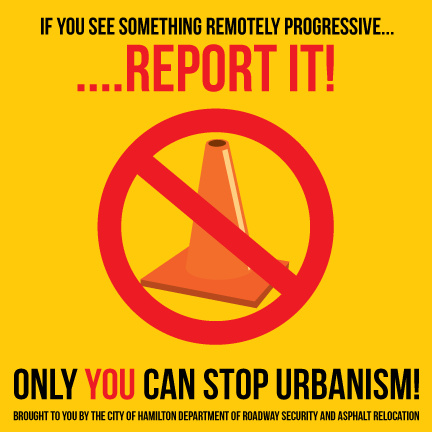 Support is exemplified to some extent by the City of Hamilton's belated response as indicated in the above article by Ryan McGreal. For an example of tactical urbanism carried out by the authorities themselves we can look to the city of Curitiba in Brazil and its progressive mayor, Jaime Lerner. When strong opposition from local merchants blocked the implementation of a plan approved six years earlier to turn six blocks of the main downtown shopping street into a pedestrian zone, Lerner went into action. He masterminded the execution of the planned conversion over a period of ... three days, before formal objections could be made. See the following story in the New York Times.